Most orders are processed and shipped within one business day. Please allow up to 3 business days for complicated or large orders. 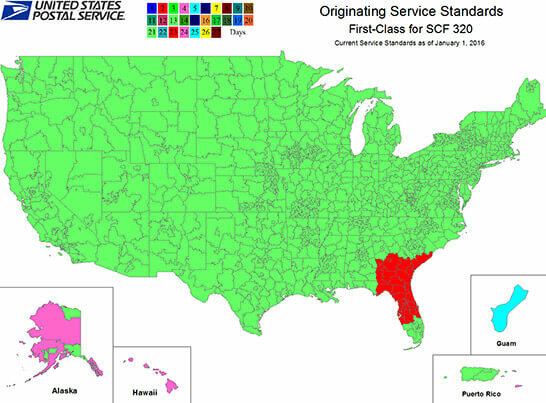 We ship from Jacksonville, Florida. 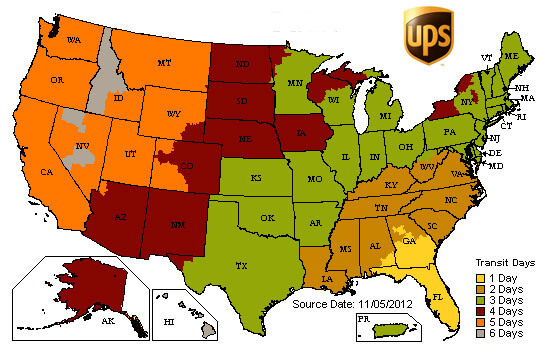 Below please find the shipping estimation maps for UPS Ground and USPS First Class. To track your UPS order, click here. To track your USPS order, click here. Name Tag Wizard accepts product returns within 7 calendar days from your receipt of the order. NOTE: the day you received your order is determined by delivery confirmation data from UPS or USPS. For an item to be returned, it must meet one of these requirements: order was lost or damaged during shipping, item had incorrect features (e.g. magnetic backing instead of pin), item has a typo made by Name Tag Wizard and not you. If a misspelling or an incorrect option was chosen by the customer when they placed their order, typically we will not accept that order as a return. However, we understand that mistakes happen so please contact us and we will try to work with you to resolve any issues. There are no fees associated with returns. We will refund your purchase price, along with shipping charges incurred, via the same method you paid with. To request a refund, click the LIVE HELP button at the top right of this page, Monday - Friday, 8:30am to 5pm Eastern Standard Time. After hours, please use our online contact form. Please have your Order Confirmation Number, Invoice Number, or email address that was used with your order ready when requesting a refund. Our reorder system is a convenient way to easily order the same product design multiple times. When orders are made on NameTagWizard, your design and production information are stored for all future orders. This enables you to place an order and return later knowing that we have your exact designs on file and ready to reproduce with additional names. By logging into your account, you can view your saved and purchased designs. To reorder a saved design, simply click the yellow "order design" button next to the saved design you want to reorder. We recommend reordering from saved designs, as opposed to purchased designs. Like any business, Name Tag Wizard reserves the right to change its pricing and fees at any time. From time to time we also run special promotions, discounts and coupons, typically targeting various demographic groups or advertising tools. We reserve the right to approve or deny any and all coupon codes, discounts and/or promotions at our discretion. There are quantity discounts available on many of our products. 5-10, 10% discount | 11-25; 15% discount | 26-50; 20% discount | 51-75; 25% discount | 76+ - 30% discount.